A nurturing school year that prepares young children for kindergarten. Children in the 4/5s hone their skills as participants in a group. In the classroom, they discuss kindness and care as the basis of all social interactions. They explore friendship while developing their own sense of identity. Social studies is the foundation of a curriculum that explores topics significant to this age group, including a focus on family structures. Our year begins with a focus on trust as teachers help children transition from home to school. Students explore the classroom materials and get to know their teachers and classmates. A phase-in schedule allows children to be introduced gradually to the routines and transitions of the school day. Within their classroom community, children in the 4/5s gain their own sense of autonomy and ownership of their environment and take on responsibility for caring for themselves and their classroom. Children in the 4/5s are active and love to move. Every day offers them the chance to challenge themselves physically on our play deck. Movement and music classes are a regular part of the weekly schedule. Hands-on science activities allow students to predict, observe, and draw conclusions as they study plants, snails, and cooking. Literacy is experienced through listening, storytelling, library visits, and learning how to print words. Classroom jobs contribute to their development as learners. Students develop an understanding that the classroom is a community where everyone helps. They also learn how to solve problems that are based on mathematical concepts—for example, “How many crackers do we need for snack today?” Ultimately, the 4/5s end the year fully prepared for the kindergarten classroom. The development and use of oral language occurs at an astonishing pace for young children and is the foundation for all literacy learning. In the 4/5s, children use and develop their language skills on a daily basis. 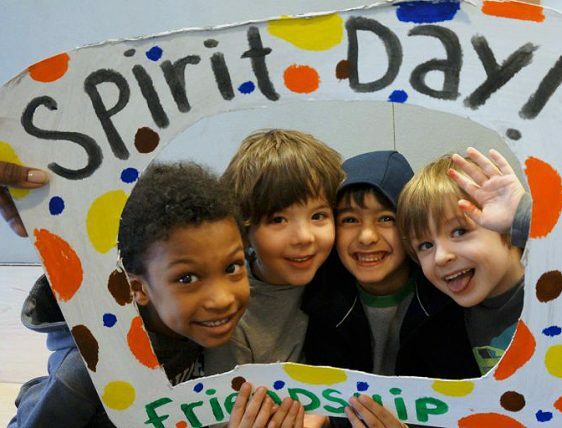 They contribute to whole group meetings, act out roles in dramatic play, talk with friends at lunch, negotiate problems, tell stories, or describe their work or their feelings. Children enjoy the language play of songs, rhyming games, and poetry. 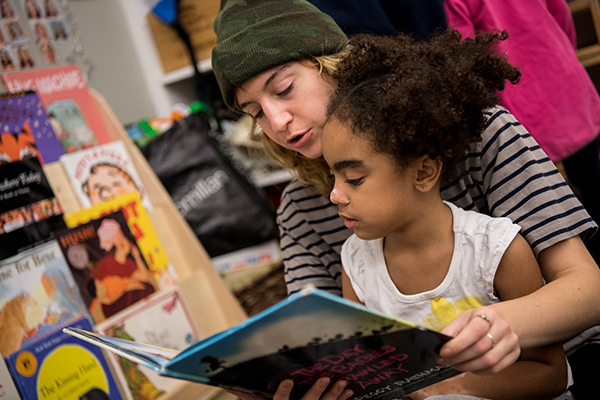 Every day, teachers read stories aloud and children respond with observations, questions, and predictions. Children use the classroom schedule cards, lists of classmates’ names, and alphabet charts as resources for their activities and work. Teachers regularly write down the children’s words to accompany their artwork, solidifying the connection between oral language and printing. 4/5s children also build on their growing knowledge of letter shapes, names, and sounds. They write books and make signs for the classroom. The Lower School Library curriculum focuses on nurturing a love of reading and on exposing children to the basics of browsing and checking out books. Biweekly trips to the library support a keen interest in books in the 4/5s. During read-alouds with the librarian, 4/5s practice making meaning of a story by understanding the interplay of words and images. They also practice responding to the story by making predictions and evaluating characters’ feelings. They build on similar skills learned in the 3/4s with slightly more complex words, sentences, and story structures. 4/5s also learn how to sift through many options provided by the librarian to choose a book to check out. They learn to ask for help finding a specific book, author, or subject; about library etiquette (inside voices and walking feet); and how to take care of library books. By the time they leave the 4/5s, children are familiar and comfortable with library routines and associate the library with time devoted to sharing a love of reading and story with their classmates. Spanish language study in the 4/5s continues the immersion approach begun in the 3/4s. The Spanish teacher starts the year by joining students in different areas of the classroom and interacts using vocabulary related to their activities. In the second half of the school year, students work in groups to complete projects related to the core curriculum, which offers plenty of opportunities to hear and use the language. Vocabulary, grammar, and syntax are tailored to the language needs of each child. When working with heritage speakers, we modify our lessons around the use of correct articles and verb tense. Students in the 4/5s leave the school year with the notion that Spanish is an accessible language that is fun and an important communication tool. Every day, 4/5s students bring their share of curiosity to the classroom. They also bring a tremendous amount of energy. Children soak up our math curriculum by taking attendance, using one-to-one correspondence to count out the right number of cups and napkins for snack, applying their counting skills to keep track of the number of children working in a classroom area, and playing math games. Through the use of materials such as blocks, children learn about shape, size, categorization of objects by attribute, symmetry, sequence, and pattern. They explore measurement at the woodworking table as they handle water and sand, and during cooking and snack set-up activities; they develop their visual/spatial skills as they solve puzzles and work with building materials. They pursue mathematical questions that arise from their own curiosity. Teachers support a spirit of inquiry by asking children to share their experience and process with other children in their groups. They document children’s work with photographs, which are then displayed in the classroom. There are endless opportunities for science in the 4/5s curriculum, which focuses on learning about the processes of growth and change. Year-round, children grow a variety of plants inside the classroom and outside on the deck. They make observations and document what they have observed in drawings. Snails are a continued highlight of the 4/5s curriculum. Children follow their curiosity by observing, touching, and reading about snails. They co-create guidelines for safely handling snails—washing their hands, using a gentle touch, and letting the snails lead the way. Hands-on exploration of these fascinating gastropods leads to rich conversations and questions like, “Why do snails have slime?” or “How do you know if a snail has taken bites of food?” Snail experts come into the classroom to respond to the children’s questions. Students also make scientific discoveries through experiments with different types of food. For example, they learn developmentally appropriate chemistry by cooking up batches of playdough and food in our teaching kitchen. Art at Bank Street is rooted in rich explorations of materials. Painting, clay, and collage are the core materials of the 4/5s art program because they offer so many expressive possibilities for children as they grow and develop. Children in any given classroom may be in different stages of development with each material. Some children may be exploring for the whole year, while others may be designing or creating representational works. There is no timeline for artistic development and there is no need to hurry it along. In fact, the longer the child can actively explore with materials, the richer the visual vocabulary he or she will have to draw upon when he or she is ready to represent. The art teacher visits the 4/5s classroom weekly and presents a question that sparks children’s thinking about a particular material. For example, she might ask, “What is one kind of line you can make with your brush?” Children are invited to share their ideas and to learn from one another. Painting: In the 4/5s, children learn set-up and clean-up for painting. As they work, children learn that colors can be mixed on the paper and on the tray as they explore a variety of marks, lines, and shapes on paper. Each child explores the paint in his or her own way and at his or her own pace. Clay: Children explore the clay by poking, pounding, pinching, and rolling, and learn that they can make all kinds of marks, and shapes, forms with this soft, strong, and malleable material. Children work on small boards individually as well as on large boards in pairs. Later in the year, coils and slabs are introduced to encourage new ideas about building, sculpting, and arranging with clay. Because children are interested in process more than product, we do not fire clay work in the 4/5s. Children are perfectly happy to return their work to the clay bin at the end of the work period. Collage: Through the medium of collage, children explore the tactile and visual properties of materials. 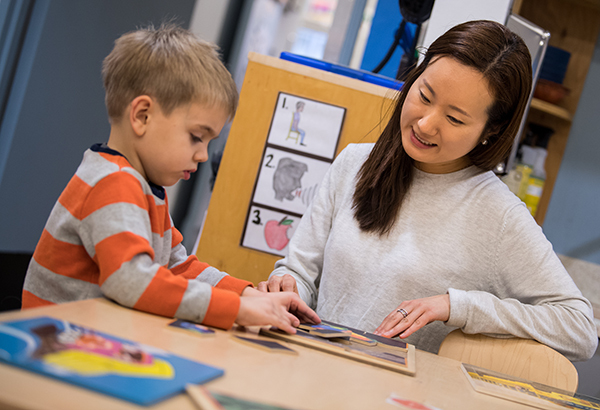 As they distinguish the properties of materials by size, color, shape, and texture, children begin making careful decisions about placement and arrangement of parts to the whole. In the beginning of the year, children explored the flat and three-dimensional properties of paper. Later in the year, children create paper bag puppets, as well as people and animal stick puppets. Construction: In construction work, children explore spatial arrangements of three-dimensional materials. 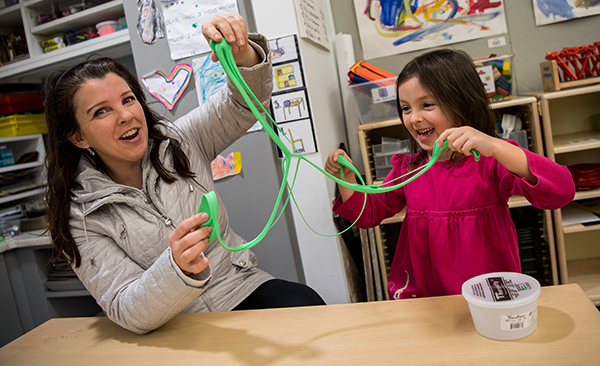 Children create wire sculptures in which they make thoughtful choices about materials, attachment, and arrangement. 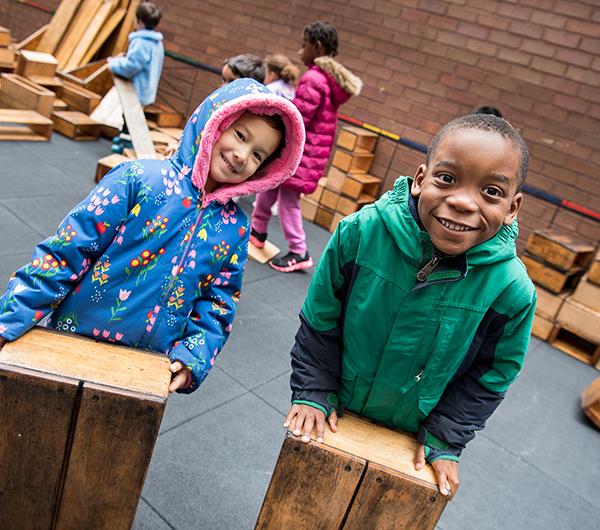 In the spring, children engage in a special wood sculpture project that challenges them to think about balance and weight, strong attachment, and gluing. 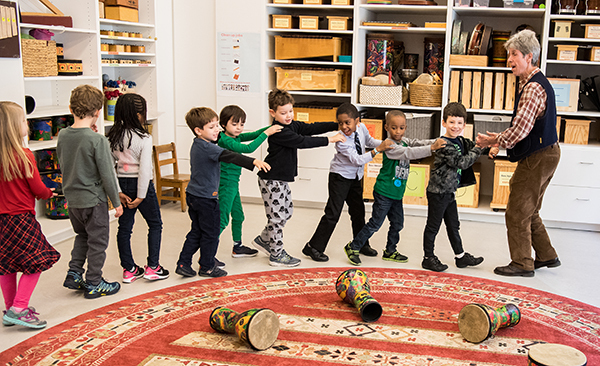 The music program in the Lower School weaves together four “pillars” of music: singing, dancing, playing, and inquiry. The 4/5s experience music in their classroom and in the music room once a week. They participate in the bi-monthly Lower School Family Singing Assembly in the lobby and once a month they join the 3/4s for a Sing-Along in the Children’s Dining Room. Twice a year, 4/5s meet in small groups for Teeny Tiny Music, a program that allows them to spontaneously explore assorted string instruments. In the fall, children play dulcimers, while in the spring they can try the violin, the banjo, the small guitar, or the harp. In the 4/5s, children’s singing range increases and their rhythmic ability on instruments becomes more controlled. The instruments that the 4/5s play include different-sized frame drums and assorted percussion instruments from Afro-Caribbean cultures. Playing pitched instruments such as the xylophone, glockenspiel, and metallophone starts in the late fall. When playing in groups, children are encouraged to celebrate their growing song repertoire by choosing songs for the group to play. By spring, children are learning singing games for Field Day and playing instruments as a band. They have developed their own “sound” as individuals and as a group and they can anticipate the initial signal to start playing as well as the final cadence that brings on the end. The 4/5s have movement for 30 minutes once a week in half groups. The creative movement class allows children to integrate their mind and body. It facilitates children’s creativity, imagination, and confidence; develops their fine and gross motor skills; builds impulse control; and fosters self-concept and self-esteem. Movement classes allow children to experience themselves as individual dancers and as members of a group. In all formats, dancers use their imagination to express themselves and their understanding of the world. Students in the 4/5s think and learn about our similarities and our differences. We work hard together to solve community challenges and learn about social activists and activism within our classroom, our school, and our broader world. Supporting children in their ability to identify themselves with language describing their race, gender, ability, religion, and socioeconomic status is a focus during the year.